Looking for American Made clothing for men? We have you covered. Here they are together. A company dedicated to bringing you fine, traditional clothing and accessories with ALL AMERICAN “Grown and Sewn” products, in hopes that from the goods sold we can make a lasting impression on at-risk dogs and North American wetlands in need of preservation through financial donations. Washington Alley (WA) is a collaboration between two best friends that share a passion for timeless men’s fashion and quality goods. Not only are we passionate about classic and timeless goods, but we are passionate about how and where these goods are made. We made the decision early on, to only showcase or produce products from the USA. 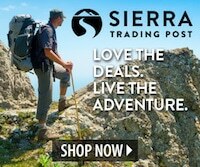 Sierra Trading Post’s mission is offering our customers the best service and value – providing quality name brand clothing, footwear, outdoor gear and homegoods at great savings every day – guaranteed. Save up to 70% on brands like New Balance. Great deals on hiking boots, cycling gear & sporting goods. NOTE: Not everything on their site is Made in USA. Link provided will take you directly to their “Made in USA” selection. The Buffalo Billfold Company creates buffalo leather wallets, purses, belts and more. At the Buffalo Billfold Company, we believe in the craftsman’s way of life: the command over materials, tools, and processes. Since 1972 our leather has been sourced from American Bison ranchers that we know. We’ve perfected our tanning recipes in exclusively American tanneries. Our buffalo leather goods are 100% Made in America and built to last. At Men’s USA we concentrate on men’s “wear-to-work” business attire which is characterized by infrequent and more predictable fashion changes, we believe we are not as exposed to trends typical of more fashion-forward apparel retailers, where significant markdowns and promotional pricing are more common. NOTE: Not everything on their site is Made in USA. Link provided will take you directly to their “Made in USA” selection. Tidal Vision utilizes typically wasted commercial seafood byproducts to make apparel and accessory products. All of our products are 100% produced in the USA. We are in the prelaunch stage right now. We are going to launch our product lines in 5 months. Sign up today! We don’t simply list brands on our site. The businesses on this page have been approved (not certified) by us. They are makers, retailers, brands, mom & pop shops, technology companies, distributors or suppliers of domestically sourced raw materials, general manufacturers, and service providers. They make or carry products Made in USA. They serve businesses and/or consumers. In some cases, not everything they carry will be Made in USA. We celebrate them anyway for making an effort. If you make/manufacture men’s clothing (jeans, tops, shirts, suits, ties, etc…) or sell these items and would like us to feature your business on this page, fill out our application and a MAM rep will respond within 48hrs. These companies use the Made in USA label and claim to be American Made. We have not approved them for MAM membership yet. Please do not assume that everything they make is 100% made in USA, some made be made elsewhere, and some may only be assembled here while the parts are from another country. It’s a great list to jumpstart your desire to buy Made in USA.